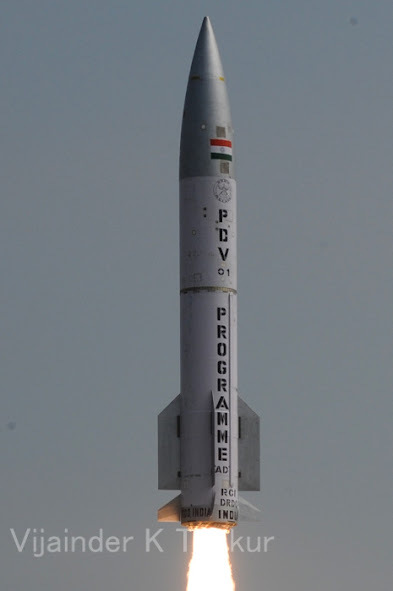 Maiden test on April 27, 2015 of the PDV exo-atmospheric interceptor of DRDO's Phase 1 Ballistic Missile Defense (BMD) system. DRDO is developing two new missile test ranges, constructing surveillance ships and sea based missile launch platforms for testing its BMD Phase-2 system for intercepting missiles with ranges greater than 2,000 km that can additionally deploy decoys or maneuver. India currently has two missile test ranges at Chandipur and Wheeler Island. Phase 2 testing of the BMD system requires two ranges placed well apart along the missile trajectory. DRDO is developing these ranges at Machilipatnam in Seema andhra and Rutland Island in the Andamans. Target missiles would be launched from specially constructed ships. Scientists are designing and developing the ships and associated systems such as radar, mission control center, launch control center, communication network and many other equipment needed for phase-II trials, Sarsawat told the press. On February 3, 2015 Jane's reported that DRDO has received approval from GoI to convert 155 hectares of mangrove forest in Machilipatnam, Andhra Pradesh, into a missile launch testing facility. The proposed site is within a wildlife sanctuary and a case against the project is pending in the Supreme Court. Range development work can only start after a court ruling. The project was cleared by the petroleum 2012, following DRDO assurances that the test range would not impact plans to prospect for oil and gas in the Krishna river delta. The ship, P-11184, will feature a helicopter deck and hangar, a long open deck with space for several tracking antennae located at the aft of the forward superstructure. Dedicated to DRDO's BMD program, the ship will be operated by the Indian Navy. Designed by Vik Sandvik Design India, the ship has a length of 175 mt, a beam of 22 mt, a depth of 6 mt and and a displacement of over 10,000 tons. It will be powered by 2 x 9,000 kw engines, giving it a maximum speed of 21 knots. The OSS project is classified and monitored directly by the Prime Minister’s Office. The ship’s keel was laid on June 30, 2014 and the shipyard has been given a timeline of December, 2015 to finish the project. The Navy, HSL and DRDO reviewed the progress made in the project in during mid December 2014. HSL received the first financial instalment in February 2013 and one more round is expected as the OSS’s total cost is reportedly about Rs 1,500 crore..
IDP Sentinel members can read a lot more on DRDO's BMD project at the link below.